"A different yet enthralling game where your decisions have a huge impact." Glory to Arstotzka! Papers, Please starts with you having won the job lottery in the early 80’s in a country that brings to mind the old Soviet states, the job won you have won is to be the immigration officer on the newly reopened border between Arstotzka and the neighboring countries. On your first day things start out quite simple just checking passports for discrepancies and then either giving them a big green stamp for entry or a big red one for denial, the next day things get a little more interesting as you can start to allow foreigners in to the country, however after a terrorist attack within your first few days in the game all sorts of different rules come in to play, now people need visa like documents to enter the country on top of all this let’s not forget you are taking care of your family and the more people you get through the border patrol each day the more you will be paid, so do you rush and risk sloppiness to get more people or take it slowly and carefully but maybe not have enough money to buy medicine for your son? 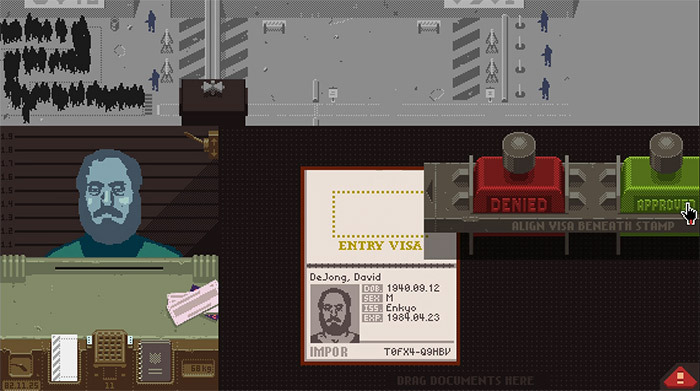 Papers, Please game provides many moral dilemmas such as this and although at the very start it may seem like a training game for an immigrations officer but as you get deeper in you start to hear more details and stories of the people trying to gain entry to Arstotzka become much more interesting, of course make sure you don’t make too many mistakes as you will easily be replaced in your position and then we can only assume the worst becomes of you and your cold and sick family. There is so much detail in this game and although it’s not full of action it’s a different and interesting concept that is thought provoking, I could not describe it as fun that wouldn’t be the right word, but it is enjoyable and it’s certainly worth playing! 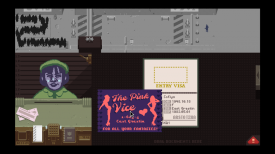 Papers, Please is an incredibly well thought and complex game and will leave you thinking, you can download it here and it’s free! A helpful guide for the basic and first few days of Papers, Please.